29 Jan Gates of Dawn- Earn a Limited Edition version of Wicker Man Eddie – Event on NOW! Battle in a new Event Dungeon! Shadow Wicker Man Eddie and The Ferryman are making their Legacy of the Beast debut in a limited-time Dungeon! From now until February 3rd at 4PM PT, battle in the Gates of Dawn Dungeon for Wicker Man Soul Fragments and powerful Talismans! The first time you complete one of the 3 dungeon floors available, you will be granted with set rewards including Shadow Souls and Titan Talismans. All subsequent victories are guaranteed to provide Wicker Man Soul Fragments, as well as a chance of up to 2 bonus rewards, including Oracle Talismans. Wicker Man fragments can be used in two different ways! Use 400 Wicker Man Fragments to claim a Wicker Man Soul. The Wicker Man Soul is guaranteed to grant a 4⭐ Magus Wicker Man Eddie, a perfect addition if you ever accidently sacrificed this character! 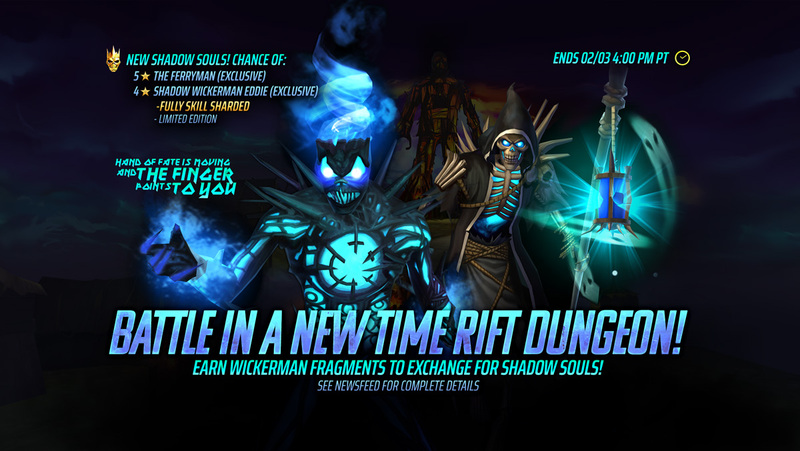 Wicker Man Fragments can be used in the Special Store on limited time items including the all-new SHADOW SOUL. The Shadow Soul is a limited time event soul which guarantees a 3⭐ to 5⭐ character of any class, with an an exclusive chance of getting The Ferryman and Shadow Wicker Man Eddie – a limited edition, fully skill sharded version of Wicker Man Eddie! 💀The Ferryman (5⭐ Magus): A devastating mage that cannot take damage from regular attacks! The Ferryman can only be damaged by Burns and damage over time effects and instead drains his own life by a small percentage each turn! 🔥Shadow Wicker Man Eddie (4⭐ Magus): This limited edition version of Wicker Man Eddie comes fully skill sharded and armed with the The Kindling passive, replacing the regular Wicker Man Eddie’s fury attack. This ability grants Immunity to Burn Effects to all allies, and has a 35% Chance to inflict a random burn effect on all enemies when you take damage. It will also heal all allies at the start of your turn based on the number of burn effects on each enemy! The Ferryman and Shadow Wicker Man Eddie are ONLY available in the Shadow Soul. Each Shadow Soul summoned will also grant bonus rewards of 10 Ferryman Fragments, and 10 Shadow Wicker Man Soul Fragments. Collecting 750 Ferryman Soul Fragments guarantees The Ferryman, whereas 350 Shadow Wicker Man Soul Fragments guarantees the limited edition Shadow Wicker Man Eddie. 🎉Event Bonus: Complete event challenges to earn a variety of rewards, including Shadow Soul Fragments and a full set of Hex Talismans! Hex Talismans are purple talismans with a 3 set effect that is not available anywhere else! Equip them to gain immunity to Max HP Reduction Effects. These Talismans also Heal for 5% of your Max HP every turn and grant a 50% Chance to increase the duration of Negative Effects on each target by 1 every turn.